Many of us in ASEAN would personally know IA and FM Maung Maung Lwin, the selfless President of the Maynmar Chess Federation who for 20 years now has single handedly kept chess alive in his country. When Cyclone Nargis hit Myanmar recently, Maung lost his businesses and yet he has chosen to focus his energies on trying to help those even less fortunate! I cannot post the copy of the official appeal of the Myanmar Chess Federation due to the graphic nature of the embedded photos but would be happy to forward it if requested by email (be warned that it is a very big file). The facts as we know them today are up to 134,000 dead and 2.4 million destitute. 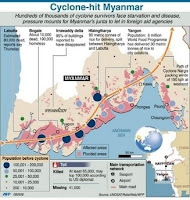 But you only need to Google "Cyclone Nargis" to see for yourself how bad it is. Chessplayers are considered rather self centered and not known to part easily with their money but let us prove otherwise this time around.